Come back home to God! Salvation is a central theme in John Wesley's writings. Wesley urged people to become and continually grow as committed disciples of Jesus Christ. His appeals and reasoning are just as relevant today as they were in the 18th century. "Wesley's 'Way of Salvation' is a road map of the journey of humanity toward God," write the authors. "It's a pathway of grace in which we respond to God with increasing self-awareness of our separation and our need to come back home. Our aim is to help people understand and apply Wesley's teachings to their lives…and to transform them from being 'almost Christians' to being 'altogether Christians.'" The authors are passionate about returning to the roots of Methodist tenets of salvation. 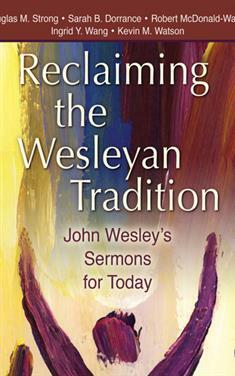 Covering biblically based doctrinal topics such as sin, grace, justification, sanctification, and ethical living, Reclaiming the Wesleyan Tradition explains Wesleyan theology in an easy-to-understand way. The book's format makes this 13-week study especially accessible. Margin notes highlight excerpts from Wesley's sermons, hymns, and journal with the authors providing context and analysis of the themes. Daily reading and writing assignments are designed to open theological discussions and to deepen spiritual growth. Wesley's words can reshape your daily walk with God. Expect to be spiritually awakened and brought into a deeper communion with God while celebrating a powerful legacy.